These are the friends I've known the longest and who have known me the longest. We've been friends since middle school and high school, which means we've been friends for over 20 years. It is so nice to have people in my life who know me and who knew me before marriage, children, and ministry. When we graduated from high school, our Sunday school politely said that we would make our best friends in college, implying that we wouldn't keep up our friendships. Although I do have great friends from college, we knew we would prove her wrong and we did. 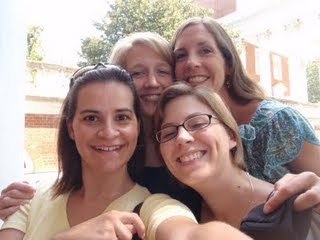 These friends, Anne, Jo, and Natalie, came to Charlottesville a few weekends ago so we could hang out. My husband was gracious enough to keep the kids quiet or occupied so I didn't have to take care of them. We were free to eat, talk, lay out by the pool, watch movies, and catch up on each others' lives. Friends are great gifts from God!